I will be speaking at two times: from 11:30 am- 12:00 pm and from 12:30 pm- 1:00 pm. We will be meeting in Conference Room J @: Doylestown Hospital. We will be hosting two groups of parents (community members and staffers) as well as an inter-hospital Go To Webinar during each presentation. Open yourself to living in a conscious and deliberate way. That includes enjoying the time you and your child spend together, whether you have moments or hours at a time to do so. When you live and parent consciously and really just enjoy your child, any time you spend together becomes priceless. “Parenting for Life”, Nina Sidell, M.A. Please feel free to reach out to me @: Nina@LiveInspiredwithNina.comif you have any specific issues that can be addressed during this event or if you want individual, couples, or family therapy and coaching. A Holiday Gift From The Heart! Featured Gift From The Heart! Get your copy and give a copy of Parenting for Life- the ideal Christmas gift from the heart. Powerful and practical, Parenting for Life offers parents with children of all ages tools to strengthen and heal their relationships. Powerful and practical, Parenting for Life offers parents with children of all ages tools to strengthen and heal their relationships. Whether you’re contemplating conceiving for the first time, are in the throes of parenting, or you have adult children, Parenting for Life provides important tools to help you connect with your growing and grown kids in new and powerful ways. Let’s spread the loving revolution for families everywhere! 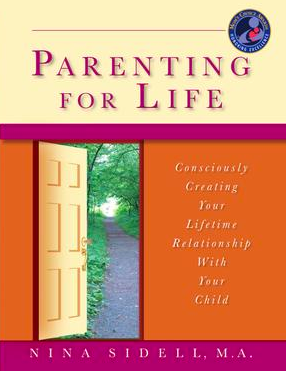 Parenting for Life is available on Amazon, Create Space, andKindle. Go to:www.LiveInspiredwithNina.com and buy your copy from your choice of book sellers right in time for the holidays. For those of you who have a copy ofParenting for Life, thank you! If you love the book, please spread the word by posting a positive review on Amazon. Reviews are so important to help others find the book and see its lifetime family relationship value. Nina Sidell, draws from more than twenty-five years of wisdom as a therapist, life coach, and–most importantly–a parent to guide others through the mazes and pitfalls of parenting today. There are three sections and homework is at the end of each chapter for parents to follow.Parenting for Life is the visionary parenting manual for individuals and couples, both before and after they become parents. It can also help heal adult children who need to better understand and forgive their parents. I am here to help you live your best life yet and to help heal the world one family at a time! Define What it Means to be Present!